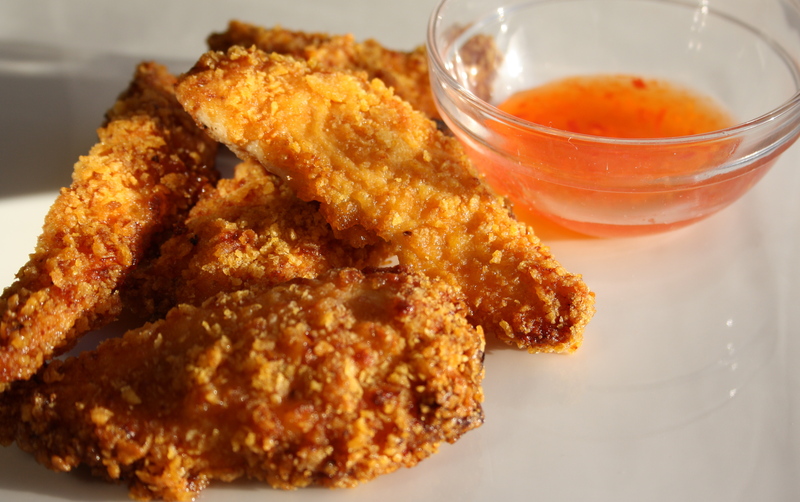 These Crunchy Gluten Free Chicken Fingers are so easy you can make these in your sleep. Make a bunch and toss them in the freezer. You’ll be happy you have them on hand for those crazy busy days. Many of my friends who have kids with Celiac have thanked me over and over again for this recipe. I have to admit, I love making myself a few when I am looking for something easy for dinner. Try experimenting with different varieties of gluten free cereals. Let me know how it works! For an Italian twist, try adding Italian herbs and dip in tomato sauce. Or, try the adult friendly version below. Or, for the fussy kid in your life, just make them plain and simple. Firstly, crush corn flakes in a mini processor or by hand. Next, In a small bowl, whisk together mayo, spices, garlic, salt and pepper. Finally, transfer corn flakes to a plate. Dry chicken breasts with a paper towel to remove any moisture. Cut into approximately 1/2 to 1 inch thick strips. Dredge each chicken strip in the mayo mixture, then press into the corn flake mixture so each strip is completely covered. Don’t overdo the mayo – you just need enough for the cereal to stick. Too much may result in a soggy finger. Transfer to a non stick baking sheet and lightly drizzle with olive oil. Do not over crowd on sheet, as you want to make sure any moisture has room to escape. Bake at 400F (200C) for approximately 30 minutes or until done. Flip over half way through if desired (not necessary). Chicken should be cooked through and golden brown. TIP: These can be made ahead and frozen. Cool on a cookie rack and place in the freezer uncovered until frozen. Place strips in an air tight zip lock bag and freeze for future use. To reheat, bake on cookie sheet in a 400F (200C) oven for 10 to 12 minutes or until hot. Enjoy with your favourite gluten free dipping sauces!